← An opportunity to get free food turns awry as 2 die struggling to get a share. The Supreme court has ordered re-tallying of presidential votes in 22 polling station. The court also demanded to be furnished with all form 34 and 36 from the 33 400 and 291 polling stations respectively. Re-tallying results should be submitted to the court by Wednesday 4 pm. The petitioner and the respondents to nominate 10 representatives each to to act as agents during the exercise. 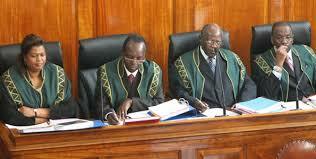 Supreme court justice Dr. Smokin Wanjala ruled that the agents will take the secrecy oath. He also said the court registrar will determin the venue of the exercise which should be communicated to the parties tonight. 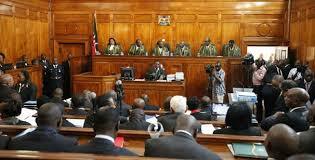 The court also rejected the application submitted by the Law Society of Kenya (LSK) on partisan grounds. Litigants from the two opposing sides all claimed LSK appeared to be partisan, and so its inclusion as a friend of the court might damage the outcome. But the same application presented by Attorney General Githu Muigai was granted. The court through justice Njoki Ndungu outlined the timeline allotted both the petitioners and the respondents, and warned each party to go with the proscribed timelines. Lady justice Ndungu warned parties that the court did not have the luxury of time and so each parties will not be allowed to extend their time completely. CORD’s lawyer George Oraro presented additional 900 hundred page affidavit, which spurred sharp criticisms from the respondents saying the affidavits were late and so they should be ignored. But Oraro defended his decision arguing he did not present any new evidence, but rather additional substantive pleadings. This entry was posted in Elections, politics. Bookmark the permalink.